It’s never too early to send your Rakhi gift! Raksha Bandhan is slowly but steadily creeping up on us and we definitely don’t want to be caught unawares! This Rakhi, your favourite gifting partner Tajonline.com brings to you another great exclusive Early Bird offer, just so that you can surprise your brother for Rakhi. Excited to know what we have in store for you this year? Well here goes! This year we present to you , two great early bird offers , and what’s better ,is getting something FREE and a discount too ! 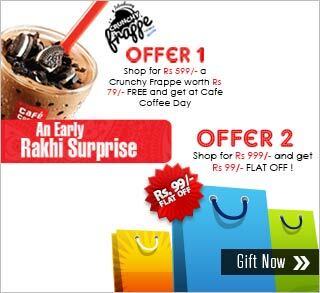 Offer 1 : Shop for Rs 599/- and get a Crunchy Frappe worth Rs 79/- FREE at Café Coffee Day ! Offer 2 : Shop for Rs 999/- and get Rs 99/- FLAT OFF ! Sending your gift or planning your gifting in advance now comes with a huge benefit. We’re sure you’re now excited and are raring to go and place your order, so HURRY! This is a very limited period offer and you need to make a dash for it if you want to avail of this fabulous offer. So now there’s a dual benefit to sending a gift, your brother gets an exciting present and it’s much easier on your pocket. Click on the banner below to know more about the offer.